What equipment do you need for GUE Fundamentals or other GUE Courses? The GUE Equipment Requirements can be found here. Look up your class in the GUE Standards to see what “Additional Course-Specific Equipment” is required. More details on each equipment component is found at the bottom of this page. Unlike in the early days of GUE, there are now many types of gear on the market that technically meet our requirements; this often will include “compliant” gear that is not the best to support the most efficient learning and improvements or your stated dive goals. Others have been before you, benefit from the well-trodden path of the specific features and designs that will make your training easier and your diving more fun! No. Once you have a backplate, harness, and wing, we find that most students are able to adapt much of their current scuba gear. We’ll make recommendations based on your goals and budget. In some locations, rental gear is available. Ask your instructor. Backplate/Harness: Rigid plate. Continuous Webbing. Wing: Single internal bladder (or bladder-less design), no bungees/elastics. More details on each component of the GUE Equipment System is available at the bottom of this page. Want a personalized pre-class gear consult? Please ask your instructor. GUE-compliant equipment is feature-specific, not brand-specific. We will recommend certain brands (and several of them) and certain models due to their track record of durability and design that work with you to get the most out of your training and dives. The GUE Equipment Configuration was originally called the DIR Configuration. There are some subtle differences between DIR and GUE, with GUE’s requirements being slightly more specific for team and standardization purposes. Following is a list of equipment that is of prime consideration. These items are required for most GUE classes unless noted with * or ** (there are some exceptions for Discover Diving and Recreational Supervised Diver that are not noted here). Mask: Low Volume mask reduces drag and requires less effort to clear it of water. Mask Strap: Strong strap that will resist breaking. Backup mask: Same fit and quality as primary. Maintained so reliable when needed. *New requirement in most recreational classes* – except Doubles/Drysuit Primers. Primary Regulator: Quality regulator that will be passed to an out-of-gas diver, downstream design fails to free flow. Long Hose: Optional in shallow, open water diving, but mandatory in deeper or overhead diving; the long hose simplifies gas sharing. When used, the long hose, along with the primary regulator, should ALWAYS be placed on the diver’s right post. 5-7ft in length. Back-Up Regulator: Quality regulator that a diver will use as a reserve either in the event of a failure or in a gas-sharing episode, downstream design fails to free flow. Must not be a compact second stage design nor integrated with BC inflator. Short Hose: Should be long enough to breathe comfortably, but not long enough to bow and create drag. 22-24 inches is common. Necklace: Designed to hold the back-up regulator within easy access. Power Inflation LP Hose: Should be long enough for a diver to easily use his/her corrugated hose, but not long enough for it to bow or otherwise create excess drag. 22 inches is common. Pressure Gauge Hose: Custom hose length allows a diver to easily read the gauge after unclipping, but does not bow or dangle, thus avoiding excess drag. 24 inches is common. Pressure Gauge (SPG): Quality brass and glass gauge should be easy to read and reliable with 100psi or 10bar increments. Typically 2-2.5 inch diameter face. Should not be housed in a large console. Harness and Backplate: Designed to hold the diver snugly to their rig while reducing drag and increasing control. Should be a rigid design. Negatively buoyant backplate helps distribute ballast more evenly across a diver’s body. Divers shorter than 5’5″ should consider a “short” plate. Harness must be made of continuous webbing with a buckle at the waist. D-rings: No more than two on the chest, positioned to reduce the drag of attached items; one hip D-ring to hold the pressure gauge. Crotch Strap: Allows for custom fit, and supports two D-rings: one works as a scooter attachment point; (divers should not hang equipment here as it would hang too low); and one further up, closer to the back plate, which works for towing additional gear. The crotch strap also holds the BC in position and prevents the BC from floating up away from the body. Buoyancy Compensator (AKA wing): Size adjusted based upon needed lift whether one is diving single or double tanks. Buoyancy should be sufficient to float equipment by itself while at the surface, but too big imparts excessive drag. Simple, streamlined, no elastic tabs or bands, rear pull dump on left-hand side. Must be single bladder. Most prefer the wing be both symmetrical and oval-shaped. Corrugated Hose/Power Inflator: Should be just long enough to allow for ear clearing and potential dry suit inflation while actuating inflator, but not so long that it drags or entangles easily. Positioned over the diver’s left shoulder. Most prefer a standard “K-style” power inflator without a pull-dump feature. Bottom Timer / depth gauge: Wrist or forearm mounted to eliminate drag and entanglement. Wrist position makes it easy to reference. Watch: Wrist-mounted, with a functional stopwatch to allow for timing safety or decompression stops. May be incorporated with depth gauge or separate item. Compass: Forearm mounted to eliminate drag and entanglement. Most prefer decent tilt tolerance. Incorporated into depth gauge is permitted, but separate analog compass is recommended. Wetnotes & Pencil: For decompression tables, dive plans, and communication. Surface Marker Buoy and Spool: SMBs of various sizes for open water diving. 3ft/1m closed circuit with combo oral/LP inflate is best for training and calmer seas. Most prefer robust attachment point and an OPV. BC pack/backpad systems allows for storage of larger SMBs that don’t fit in pockets for increased streamlining. Deployed with a simple, slightly negatively buoyant “finger” spool with 100-150ft (30-45m) of line and double-ended boltsnap, stored in pocket. Fins: Rigid paddle blade, neutral or negatively buoyant. Must not be a split fin. Those using thicker exposure protection often prefer a negatively buoyant fin. Most prefer to have any attachment buckles that can break to be replaced with a more robust connection, such as a spring strap. Most prefer open-heel style fins. Booties: Neoprene booties are required if fins are open-heel style and diver is not using a drysuit with incorporated boots. Thermal Suit: Appropriate to keep diver alert and comfortable. If dry suit used, undergarments rather than the suit provides insulation. Tri-lam shell suits reduce buoyancy swing with depth. Hood: Where necessary to keep diver alert and comfortable. Strongly recommended for all cave/overhead diving regardless of temperature. Clips: Single-sided boltsnaps to secure long hose, spg, backup and primary lights (2-5 needed). Double-enders secure spool, any items placed in pockets, plus one extra if a primary light is used (1-4 needed). Ask your instructor for appropriate sizes based on location and your water temperature. Most prefer high-quality stainless steel body and springs for durability. *Pockets: These pockets are ideal for storing wetnotes, decompression tables, backup mask, small guideline spools, or other necessary equipment. Pocket(s) maybe be hip-mounted on harness, incorporated into pull-over shorts, or permanently attached to exposure suit. Pockets should be hip- or side-of-leg mounted for streamlining. *Overboard Discharge: Also known as a P-Valve; used with a condom catheter for men or external catheter device for women to allow for urination during long dives with a dry suit. **Knobs: Soft knobs, to limit risk of breakage, should be opened completely. **Valve: Contingent on environment and diving activity. Dual orifice valves (H or Manifold) are an excellent way to increase safety and redundancy. Single tank valves should always be standard “diver’s right” hand side valves. Doubles valves should be DIN, 200bar is sufficient for all pressures, it should have an isolator, and the crossover bar should be barrell o-ring sealed (not face-seal). Cylinders: Contingent on environment, weighting considerations, and diving activity. **Back-Up Lights: TWO. Tucked away to reduce drag but still allow for easy one-hand removal. Disposable alkaline batteries and twist to activate increase reliability. Focus beam aids signaling and performs better in low visibility waters. Required for Tech Rating/Rec 2/Nav/Rescue/Triox/Rec 3/Tech and Cave classes. **Primary Light Head: Rigid Goodman handle allows for hands-free diving while allowing the diver to easily direct the bright, focused light beam. Rechargeable battery and sufficient burn time based on environment. **Primary Light: Handheld-cordless or Hip-mounted, canister-style light; this is optional in some environments, but valuable in nearly all. Rechargeable battery. Focused beam. Tech-rating divers may use cordless, but will be expected to know procedures for using a light with a cord. Required for Tech Rating/Rec 2/Nav/Rescue/Triox/Rec 3/Tech and Cave classes. **Guideline Reel: Use is contingent on the diving environment; it is usually mounted on the rear crotch strap D-ring for streamlining and to reduce clutter. Only required for Cave and Tech classes. Reel or extra spool required for Rec 2/Nav classes. **Safety spool: A simple 150ft spool used in overhead environments. Spools are kept in the diver’s pocket(s). Only required for cave/overhead classes. **There are additional requiresments for Tech/Cave/Rec 3/Triox classes that may not be included here. Your instructor will outline the requirements. More details and pictures can be found here on the GUE website. 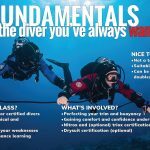 Your Wet Rocks Diving instructor will provide more detailed, current, and specific info on equipment based on your goals and the GUE class you’re taking and can help review items before purchasing to insure they meet class standards and are a good investment.